The whole of the Wollumbin Caldera rim has many significant Feathered Serpent Starlore, Marriage Lore, Creation Lore and Increase and Initiation Ritual sites, which the ancestral people, the Yoocum Yoocum, call ‘Djurebil’ – sacred sites of lore. The Yoocum Yoocum call their sacred lore ‘Bootheram’ or ‘Boojeram’….Boodjera means Love ……and Creation is always about Love stories” ……. 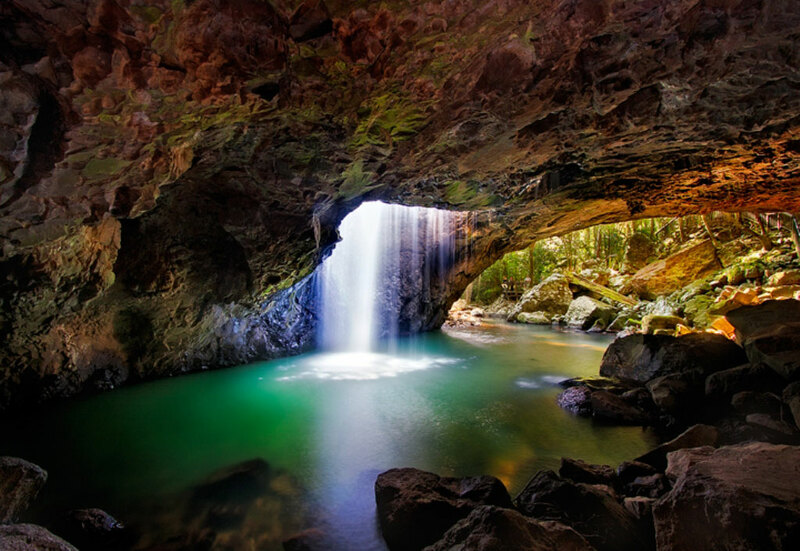 Burrigans Cave – Natural Bridge – is a sacred creation site for the Yoocum Yoocum, which is part of a ‘complex’ of connected Djurebil, located high on the Mesa’s of the Wollumbin Caldera Rim. Natural Bridge in the Springbrook National Park …..it is the home of the Kalibal or Gullival tribe of the Yoocum Yoocum moiety…and it is an Eel djurebil increase site…. Grandmother Rainbow Serpent, Warrzum, and the Seven Sisters, Wiangarie , created the primordial waters…. Way back in the Alcheringa, which means ‘the beginning’ , when there was no plants or animals…the earth was very new…. Grand Mother Warrzum and the Seven Wiangaree came in to this ancient country through the waters – bringing the fresh ‘water of life’…. Grand Mother Warrzum and the Seven Wiangaree, , traveled into the primordial landscape…….Warrzum carved the underground caverns… creating underground rivers under the volcanoes….cooling the ancient landscape, all the way across the continent…..and Wiangaree , the Seven Sisters, used their magic digging sticks to release the springs of fresh water throughout the prehistoric landscape. This Women’s Water Lore teaches us how through the waters how all life is created and connected …..
Burrigan is the Yoocum Yoocum sky ancestor akin to Jesus….. a Burram Yanbuhyn- a teacher of the lore – instructing how to be a good moral being and live in unity with all creation …. At night Burrigan sings to the spirit of his Sky Ancestors who sent him down to earth…, and they light his cave…..just as the Stars Ancestors light the heavens every evening…. If you would like to take a walk with the Spirit of Burrigan – Connect with the Rainbow Serpent Women’s Water Lore – Experience the beauty of the Glow Worm ‘Stars’ in Burrigan’s Cave – Breathe the tranquility of the Rainforest , or indulge in a Luxury Limousine Hinterland Tour, the joy of sharing Star-lore and the connection of the Spirits of Creation in the waters of Wollumbin Caldera is an experience you will cherish forever. Contact us to design your personal Wollumbin Tours experience today. All Cultural and Intellectual Copyright [Moral Rights] of the Ngarakbal Githabul is protected under international lore…. Enter your email address to follow Wollumbin Tours & receive notifications by email.